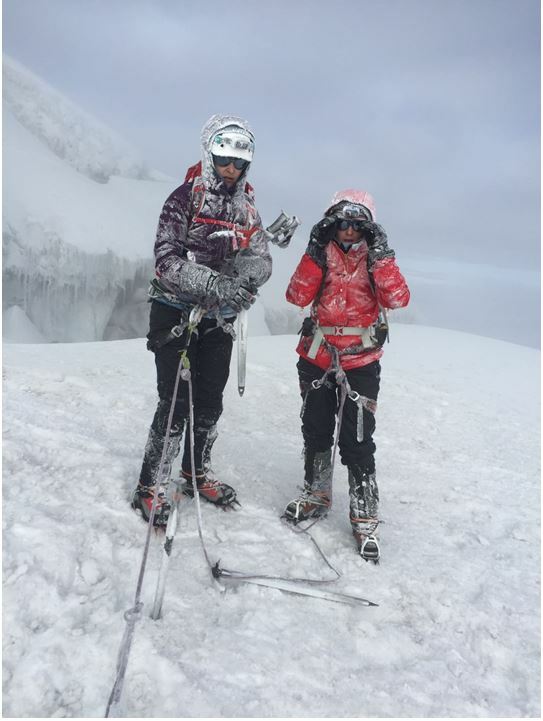 Nicole continues to describe the challenges when they reach the summit in triumph and then trauma comes unannounced …..
“Diego had predicted it would take us 8 hours to summit, we had not predicted the howling winds. The temperature was -15C, when we stopped to drink or rest we would start shaking from the cold. We were wearing five layers of thermal clothing; we just couldn’t stop to rest. By now we were in thick clouds and rime frost had completely covered us, my black gloves were white, my hardshell jacket was stiff from ice. 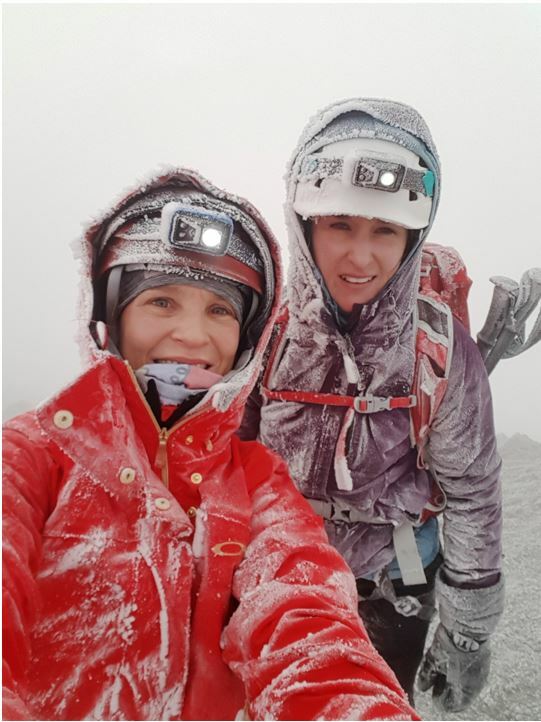 Marelise complained that she had something in her right eye, we told her it was the ice in her eyelashes, the wind made it hard to communicate, the altitude made us slow to think. The lights of the rope party ahead of us appear from between the seracs and would give us an indication of how far we still had to go. When Diego said we only had another 15 minutes to the summit it was hard to believe, it had only taken us six and a half hours. The last 15minutes was only around 10 meters in altitude gain but was so steep we had to use our hands to pull ourselves up and we were reduced to a crawling pace. We summited, I was proud, I was exhausted and I wanted to cry from relief. The spectacular views I had hoped for were obscured by the whiteout conditions, we couldn’t see into the volcanic crater but we could smell the sulphur. The clouds had lightened so we knew it was now daylight but we didn’t get to see the sun rising from the curve of the earth. We took a few photos and then turned around to escape the cold. At the summit, (5897m) covered in rime frost. I felt the rope tighten on my harness and turned around to see Marelise had slipped, she got up and we walked a few more steps. Marelise slipped again, she was off the path. Diego shouted at her to stay on the path, above the wind I heard her say “I can’t see the path”. We got to a safer part where we could stand next to each other and I looked at Marelise, her eyes were cloudy/milky. She had completely lost vision in her right eye and could make out the blurred shape of my red jacket with her left eye, she couldn’t see her feet and she couldn’t follow the trail. I couldn’t think properly. I have read up extensively on altitude medicine, this doesn’t make sense to me. She is clearly lucid so can’t have high altitude cerebral oedema (HACE), has she had a retinal haemorrhage, she has a family history of glaucoma, could it be that? Diego is calm, he says we need to descend quickly, the altitude is the problem. He shortens the rope between himself and Marelise and uses it to guide her down. 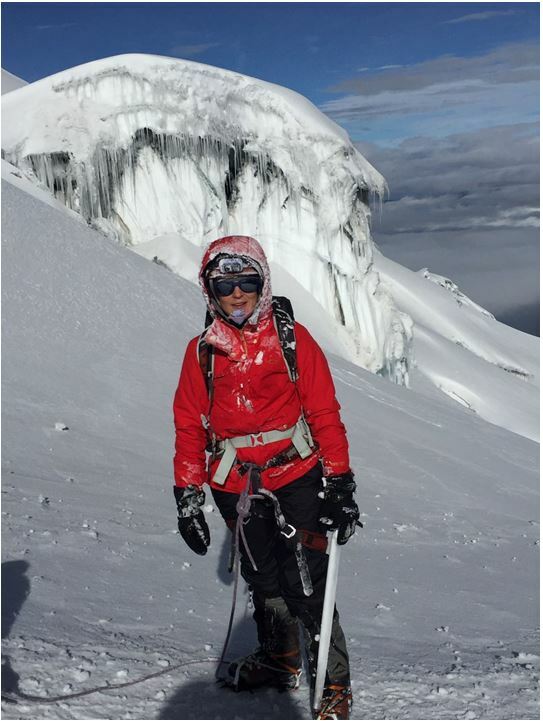 Remember all the crevasses and narrow ledges we passed on the way up, we now have to go back over them, this time with Marelise blind. I have never been so scared in my life, Marelise is remarkably calm. We know panic is not going to help, we just have to get down. 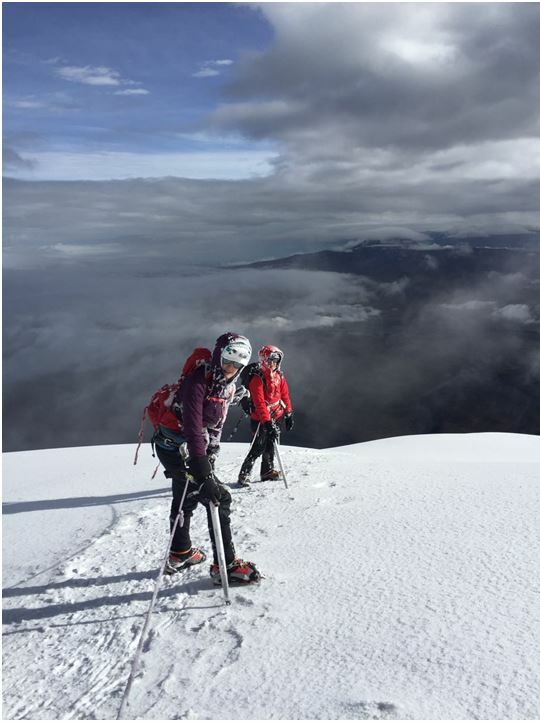 I trip and my crampon comes loose, Diego tells us to concentrate, we have to get down the glacier fast but safely. Eventually the wind drops and the sun starts to appear, the views are like nothing I have seen before, seracs the size of houses with icicles hanging off them, it is spectacular. I can’t think of taking pictures, it seems wrong when Marelise can’t see anything. We stop to drink the last of our mostly frozen water, we are passed the dangerous sections; Diego takes a few photos with his phone. Three hours later we make it back to the refuge, we quickly pack up our sleeping backs and take the scree slope down to the car. We drive back to Quito where we go straight to an eye hospital, this is a stunning modern private facility. An optical coherence tomography (OCT) scan shows that Marelise has severe corneal oedema, a reversible condition caused by the low oxygen and freezing conditions (altitude blindness). She gets drops to put in her eyes every few hours. Her vision is completely restored 3 days later. 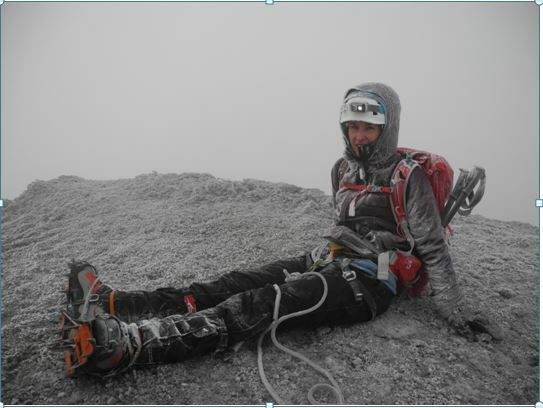 Mountaineering has fascinated me for years and I am very fortunate to be in a position to travel and experience it. I know that summiting a mountain has no practical value and as we learnt, things can go wrong. In spite of the altitude blindness, the poor conditions and how physically exhausting it was, I still can’t stop thinking about climbing more mountains.